Detective Jackson “Jax” McKenna walks into a psychologist’s office and finds that the doctor bears a striking resemblance to his first love, Lainie, who disappeared ten years ago after their disastrous first date ended in violence. Dr. Elizabeth Parker is really Elaine Wilson, Jax’s Lainie. She’s been in hiding since the night that changed both their lives. Jax discovers the truth when the killer lets Lainie know he’s found her. When Jax and Lainie go on the run to keep Lainie safe, old feelings resurface as the killer threatens their lives. 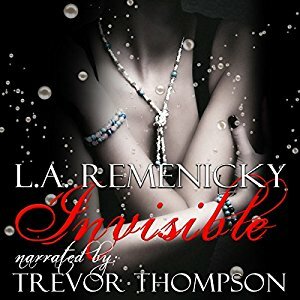 Can Jax save Lainie and help her stay Invisible? The name on the file folder, J. McKenna, gave me a chill. He had been wounded in the line of duty—shot by a bank robbery suspect. Seeing the name reminded me of where I came from and why the need for hiding existed. I pushed the memories down. I’m not that person anymore. That person doesn’t exist. It wasn’t necessary to touch the necklace underneath my sweater as a reminder, but it had become a nervous habit. The locket was the only thing I had kept from that life. The door opened and Sheila showed my patient in. As my eyes met his, my heart stopped for what seemed like hours. After reading the file, I was afraid of this. How many Jackson McKenna’s could there be? The hair is shorter and the face is older, but it’s him. I would know those eyes anywhere. Jackson McKenna. He was my first love and indirectly, the reason I had to use a cane to walk farther than across the room. I cleared my throat and stood, reaching out to shake his hand as I would with any new patient, hoping he didn’t recognize me. When I realized his right arm was in a sling and we couldn’t shake hands, I dropped mine back to my side. Picking up my notepad and pen, I hoped he didn’t see the way my hands were shaking. He sat on the couch across from me, observing with those hazel eyes that have haunted my dreams for ten years, and then he shook his head.